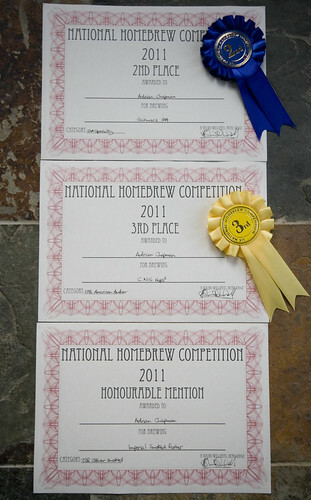 5 Responses to "UK National Homebrew Competition 2011"
Always follow your posts and blog with interest – it’s good to get some validation on all your brewing efforts like this. Congratulations on your certificates 🙂 Fingers crossed for a first next year! thanks 🙂 I got this last year too A total surprise, we were joking about ‘what if I won something’ then we found a rosette hanging on my bottle!! !